offers a perfect flooring solution to everyone who values genuine solid wood material while avoiding the inherent limitation of expansion and/or contraction of a hardwood floor. Materials used in the construction of Florever engineered hardwood flooring contain non-evaporative substance and are assembled under the European Standard (EN 13489:2004); therefore, quality and safety are guaranteed. Florever engineered hardwood flooring is built to last a life-time with proper care and maintenance. is committed to offering only finely selected premium quality solid wood for the construction of all its top layer engineered hardwood flooring. The thickness of up to 5 millimeters, above industry standard, is as close a quality as a solid hardwood and it allows for multiple re-sanding, if ever needed. Coupled with seven UV Acrylic coatings, Florever engineered hardwood flooring is less prone to dents and scratches under normal wear and tear of daily residential usages. pays as much attention to the construction of the bottom layer as it does to the top layer. 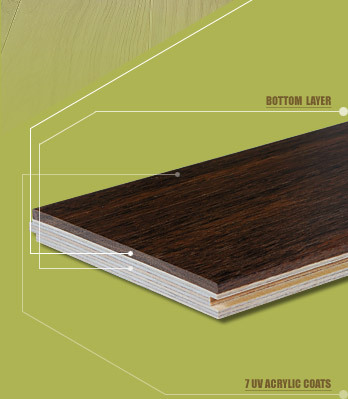 Multiple layers of woods, between 5 to 9 layers depending upon the width of wood species, are assembled in a cross-grain structure for superior dimensional stability. Special moisture-resistant adhesive which contains less Formaldehyde than the requirement by the European standard is used in the process. The unique engineering process improves not only the stability and durability; its factory finishing eliminates the need for sanding and finishing after installation; thus, further ease the installation process. Florever’s engineered hardwood flooring is the perfect replacement for solid hardwood floor with all the extra benefits. The ability to tolerate humidity of up to 60% makes it most suitable for such places as kitchen, powder room, utility room, and other places where solid wood flooring are not recommended. 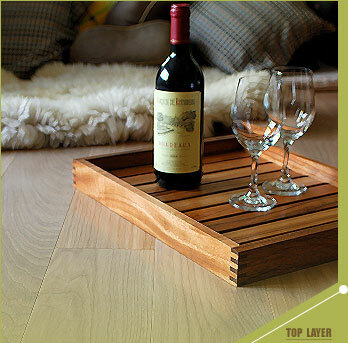 engineered hardwood flooring is applied with 7 UV Acrylic coats, a technology from Germany. The technology gives maximum protection to the wear and tear of residential usages while allows for natural beauty of the wood grain to be revealed. In addition, the varnish used in the coating is solvent and toxin free, which creates less pollution and protects the environment.